"Today I'm in the best running shape of my life"
I got back into running about 6 years ago… 39 years old, out of shape, 192 lbs, with borderline high cholesterol levels and some chronic ITB and knee issues. The pivotal event triggering my running revival happened at a family reunion. I got on the treadmill next to my sister and was not being able to go more than ¼ mile without getting out of breath. I committed to myself that I would get myself into better shape before my 40th birthday. Today I'm in the best running shape of my life. Knock on wood. Just completed my 13th marathon and ran a PR of 3:20:20, accomplishing my BQ goal. Coach John has given me superb advice and leads by example. "I've worked with a lot of coaches in my early running years and I really feel like coach John is one of the best coaches out there"
I ran in High School for two years and four years in college - both track and XC. I was a decent runner in college but when I finally started putting things together in the last few months of my college career I lost the motivation to run when I started working full time. Then I took a very long break and didn't run a step until I was in my early 30s and was very inactive and unhealthy. Since I started running again I lost over 50lbs and my times are starting to get close to what I ran in college. 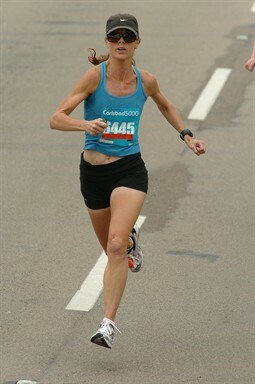 I ran my first marathon in November '08 in 3:03. It was miserable ending in a death march and I had no intentions of running another marathon, but my wife found out that it was a Boston qualifying time and she encouraged me to give Boston a try in '09 since she went to Wellesley and had good memories of the race from her college years. Before Boston I picked up the training a bit and ran a 2:39, which was way better than I expected going into that race. That race about destroyed me though and it took me six weeks to recover so I decided to focus on half marathons for a while and showed some potential at the distance with 4 PR's in a row and eventually dropped my time to 1:10:57. This year I changed my focus back to the marathon and I started the year with a 2:32 at Houston. [Gio ran a PR 2:29:04 at the Carmel Marathon in 2013 and a PR 1:09:21 Half in Indianapolis in 2012 - Ed.] I've worked with a lot of coaches in my early running years and I really feel like coach John is one of the best coaches out there. I'm glad to be a part of this group! "My long-term goal is to qualify for Boston"
"Immediately training with a coach was so different....He taught me to run in a "disciplined" manner"
I ran my first marathon in 2009 without a clue. I didn't drink water till mile 18, threw the GU that was being given away because I had no idea what it was and basically crawled to the finish. I swore up and down I would never do another one again....but yup....you all know the story. I met coach on one of my long runs in Huntington Beach. I spot "speedy" runners right away. I ended up stretching right where he parked his car and to my surprise this "speedy" guy started talking to me! I was so excited. He told me a little bit about himself and his coaching. I told my husband immediately about him and he told me to sign up. I was not sure how "serious" I wanted to be about this whole running thing. After my 6th marathon.... I was frustrated. I missed the BQ by 4 min....but more than anything I was tired of hitting the wall at 22 miles. My husband surprised me with a mother's day present and signed up with coach for my next marathon. Immediately training with a coach was so different. I think everything I was doing was wrong. He taught me to run in a "disciplined" manner and more than anything he gave me the courage that I could not only BQ but actually do better. I ran Foot Traffic Flat in Oregon in 2011 and BQ'ed with a 3:39. Better than I ever imagined! So.....now I'm training for Boston. Excited....super nervous....Hopefully I can meet more of you on those Back Bay runs! I started working with John to run a qualifying time at Boston 2010, which I did, but made substantial gains when I continued working with him for a second season with a focus on form and 5K’s. Even though I could run a qualifying marathon time, I’ve always been a “shuffler” and struggled with any type of fast running. John’s track sessions are structured for all abilities, with runners staged so that everyone finishes the repeat/interval at the same time. His track sessions are fun as a group and offer camaraderie as well as a good workout towards your goal. We worked on changes to my form, still very much a work in progress, but I’ve already started to see the results in becoming a more efficient runner. John’s style is encouraging and he’s always available to answer questions and provide advice. Within six weeks of training, I ran a 5K under my goal time by 30 seconds, and my second 5K just weeks later was another 20 seconds faster, an improvement from the previous year by over 1:30 seconds! … something that just wouldn’t have been possible without his training. I would highly recommend John for training of any distance or goal! Just watched the old and new videos. You are a miracle worker, I look like an actual runner. I also forgot that used to run knee braces. I knew my foot was coming down on the side but didn’t know it was that much. I also thought that I was landing in front of me instead of under me. Looks like that is not the case. I’m glad the video shows that. One of the things I enjoyed most about working with John was the ability to stay in touch with him throughout my training to get his feedback, to adjust my schedule and routine, and to answer any questions I had about workouts. In addition to the customized workouts and focus on building up my mileage in such a way as to avoid injury, John also did a great job of giving me the encouragement and mental toughness needed to run a successful race. I have said to many friends that the two biggest things I took away from John’s training program were the endurance and confidence I needed to breakthrough those physically and mentally challenge miles every runner encounters in the marathon. I am looking forward to working with John on my upcoming 5k-10k season and would encourage any runner who wants to “run their potential” to talk with John about creating a custom program for them. I worked with John to prepare to run my first Boston Marathon. From our first introductory meeting all the way through post race recovery, he was a fantastic coach and mentor. Training plans were constantly revised and adjusted according to what he saw in my workout times and how I felt. Paces and distances were fine tuned very specifically in order to push me to my potential without over doing it and risk burnout or injury. He is extremely responsive and provides constant feedback through emails, live conversations, 1:1 practice sessions, and an interactive website that he sets up to monitor the weekly plan. Additionally, John was great in his coaching of race strategy, which we used in some tune up races of shorter distances as well as an exhaustive coaching session specific to Boston. We also worked on running technique, something that I had previously dismissed, thinking I already knew how to run–I just needed to get better conditioned. In my previous 3 marathon efforts I used a cookie cut training plan and attempted to follow them, usually with the mindset that “faster must be better” for every run, especially on long runs. John’s plan emphasizes a wide variety of workouts and building up total mileage without overdoing the speed on long runs, keeping focused on peaking for the race day. The result was beating my previous marathon PR by 9 minutes and just as important, I was able to meet my goal of running every step of the way while finishing strong. Boston was a great life experience by itself and was definitely made even greater due to John’s expert coaching and encouragement! I have always enjoyed running and competing. Last January after running my second half marathon on my own, I felt like I could achieve better results with some training and focus. I heard about John through a friend and was eager to start working with him. After a thorough analysis of my mechanics, the training workouts he provided me were the perfect combination of what I needed to improve. Before, my workouts were just runs with little emphasis on goals or focus. I love having specific workouts and goals with targets for each run – something I definitely would not do on my own! John is always available via phone or email to answer any questions I may have and his online training log is very easy to use. I am pleased with the success I have already had after just a few months of following the training program. I ran the Carlsbad 5000 in April and knocked almost a minute and a half off of my previous race time, with a time of 18:46! 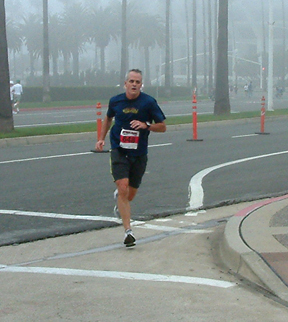 Then, my second goal was to improve my half marathon time which I successfully did in the OC Marathon; I was first in my AG with a time of 1:27:57. Now that I have completed one training program with improvement, I am ready to train for some more PR’s. With John’s structured and personalized program and support, I am looking forward to more success. Thank you , John!!! I’ve been running all my life but when I met my future husband, Bob, I became a marathon runner. 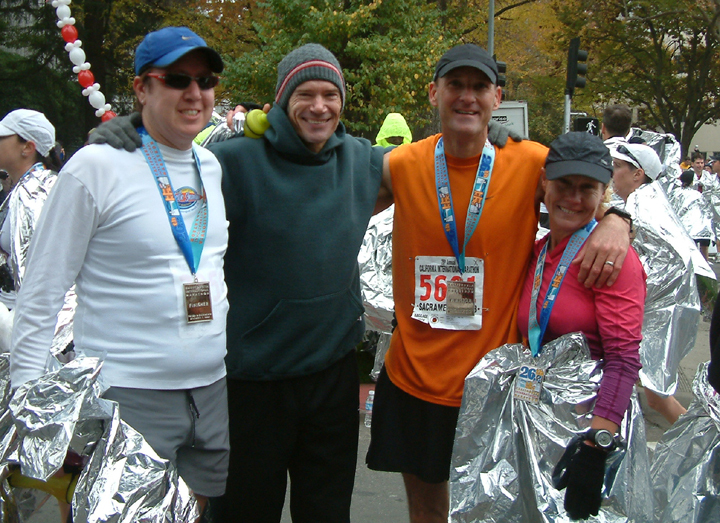 When Bob and I went to see Coach John run the Boston Marathon in ’08 we were psyched by the whole experience. All the serious runners, the crowds, the history of the event and those great jackets So of course we had this strong desire to run it ourselves but I needed to drop over 35 minutes to qualify! John said he would train us and he put together a comprehensive 6 month schedule. I wasn’t sure I could do it but trusted the game plan. It was hard at times, really freakin’ hard, but my confidence increased as time went on. 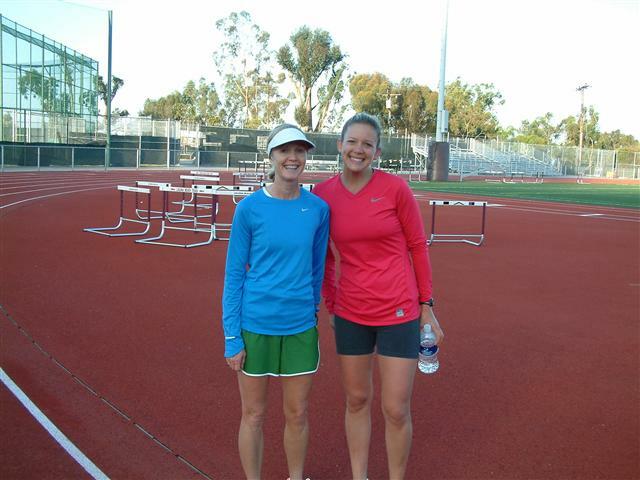 When I ran a 5K PR at a tune-up race two weeks before CIM, my confidence soared. I was 1000% physically ready. John prepped me mentally, gave me the right mind set, and helped me with things to focus on in the race. When I got to mile 19 .. I knew I had it. I crossed the line with a 3:47:17 (a 38 minute PR!) and qualified to run the Boston Marathon! We had such a great time at the ’09 Boston Marathon. It was so cool to be there as a runner, buy all that cool gear and soak up the whole atmosphere. It was one of the best experiences of my life! We plan on returning next year to set a new Boston PR. What I learned from this whole experience is that if you put in the time, if you do the work, you will be ready. I also learned to be mentally strong! I had been running since ’99 and completed 6 marathons with a PR of 4:05. I had thought about qualifying for Boston and after seeing John run it in ’08, I knew I had to do it. The qualifying time for my age group was 3:30 so I had my work cut out for me. John set up a program with weekly mileage goals, paces, speed work, etc. I was convinced I could do it. It really wasn’t hard but it took a major commitment. I felt very well prepared for CIM physically since I had done absolutely everything and felt mentally confident also. CIM was the first time I felt like a real marathon runner. In all my other marathons I had faded and the last miles were painful. But at CIM I kept my pace throughout and ran a 3:28:55 (a 36 minute PR). I learned to follow the training, follow the schedule. I could not have qualified without Coach Loftus.